I nearly choked when I saw how many months have passed since I did one of Celia’s In My Kitchen Posts! Since this happens to be a long weekend in the US, I’m making time to do one this month. 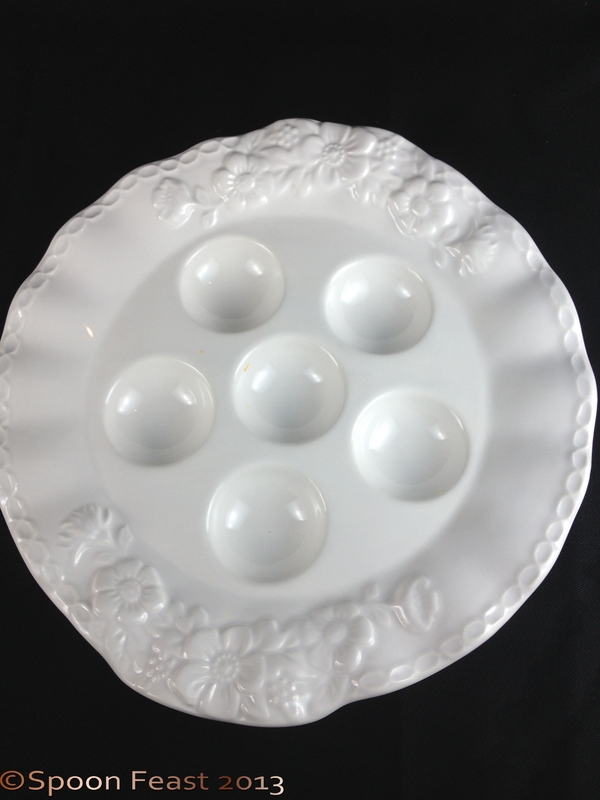 In my kitchen this summer, is an egg plate that holds 6 deviled eggs. I loved the small version. Now Robert and I can have deviled eggs without having to make a whole dozen just to fill up the plate. (Yeah, I’m obsessive like that) I think it’s funny how the depressions in the photo have the optical illusion of being convex rather than concave. 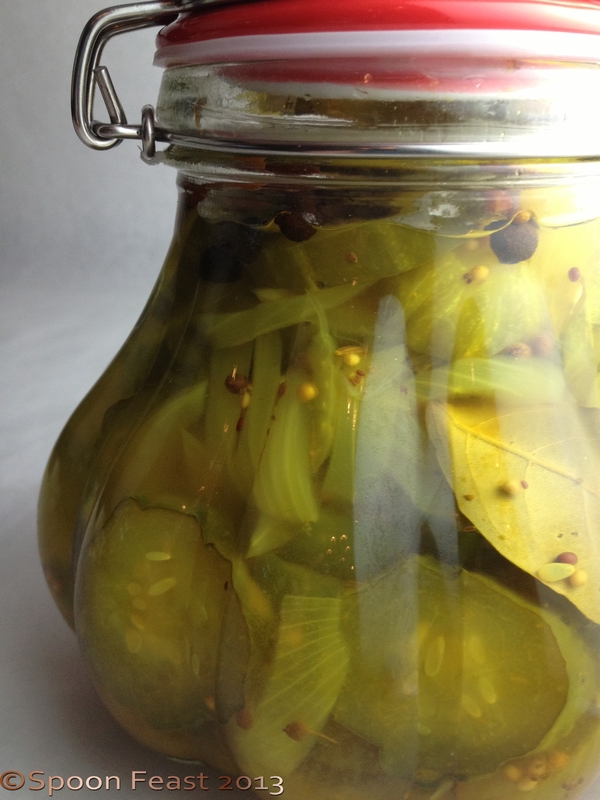 I’ve been pickling up a storm this summer. I hope we have enough to last us this winter. I’ve made Sweet Pickle Chips, Half Sours, Dill Pickles, Pickled Cauliflower, Pickled Beets, Pickle Relish. When I was done pickling, I made jams. 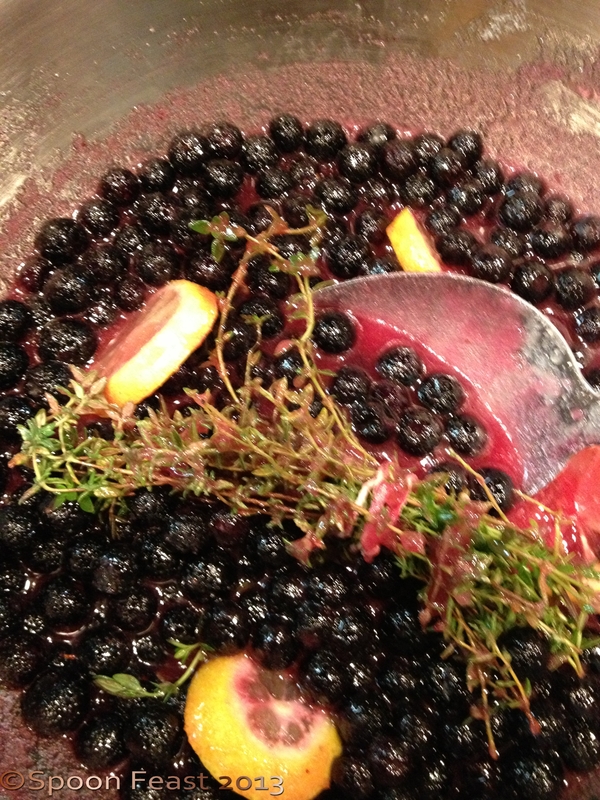 Blueberry, Lemon and Thyme, Strawberry Basil Balsamic and Whole Fig and Lemon. These two were also in the jam batch: Peach, Pepper with Ginger, and Mint Jelly. 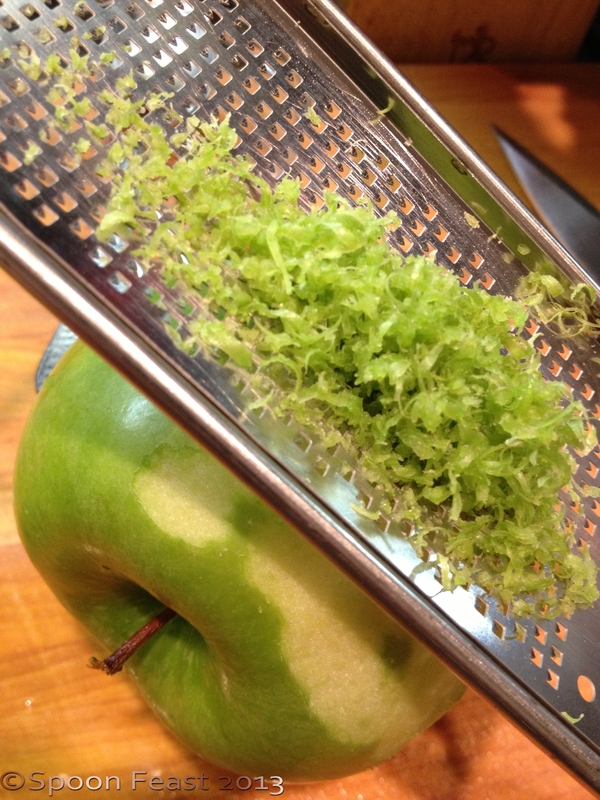 I used natural pectin by using grated apple peel. While the canner was out, and to take advantage of 4 gallons of boiling water, I also threw together a batch of Heirloom Tomato Salsa, Homemade Ketchup, and Dijon Style Mustard and our own processed Horseradish. 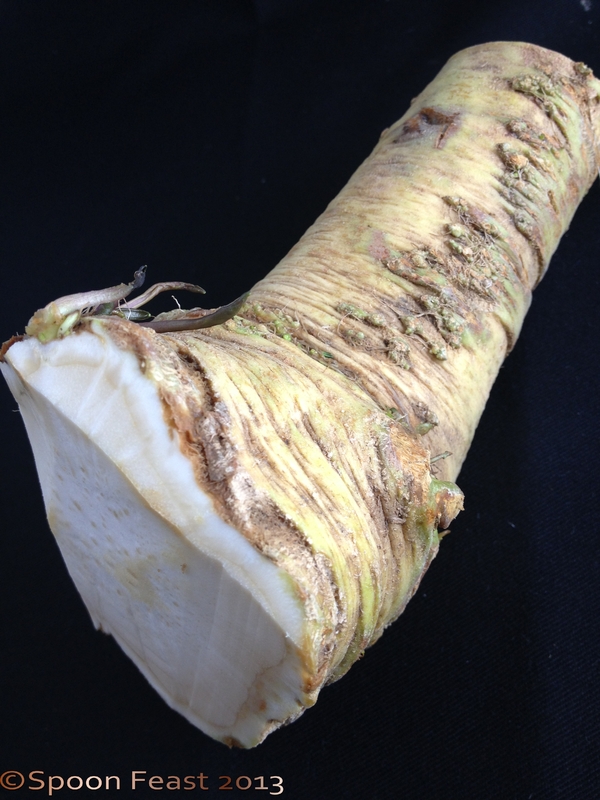 Horseradish Root. See the sprout on the end? It sprouted so now it’s growing in the garden. In a pot since I understand it spreads and is hard to control. I just cut the sprouted bit off, stuck it in some dirt and before too long it grew. The “PING!” of cooling jars seemed to be non-stop for several days. Now I have to find somewhere to store all these jars! 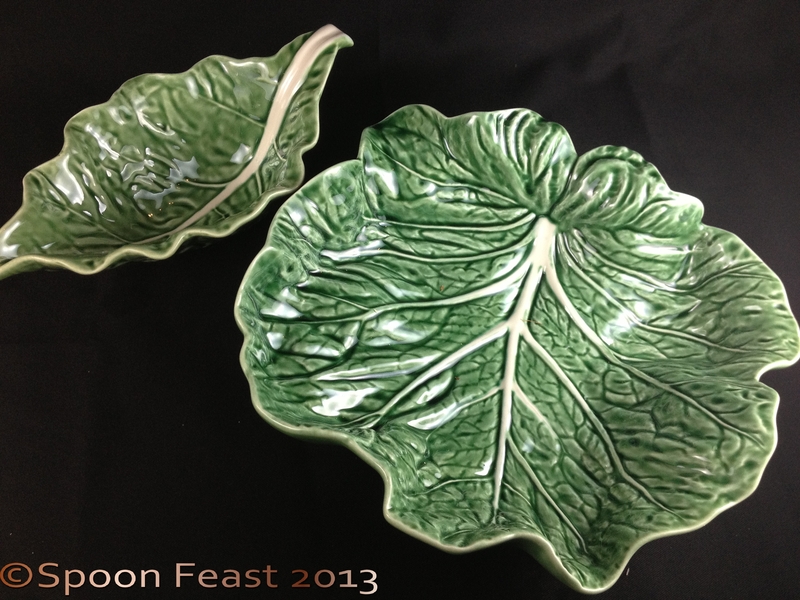 I found this great bowl and sauce server in the cabbage Leaf patters by Majorca Ware; I just love it! 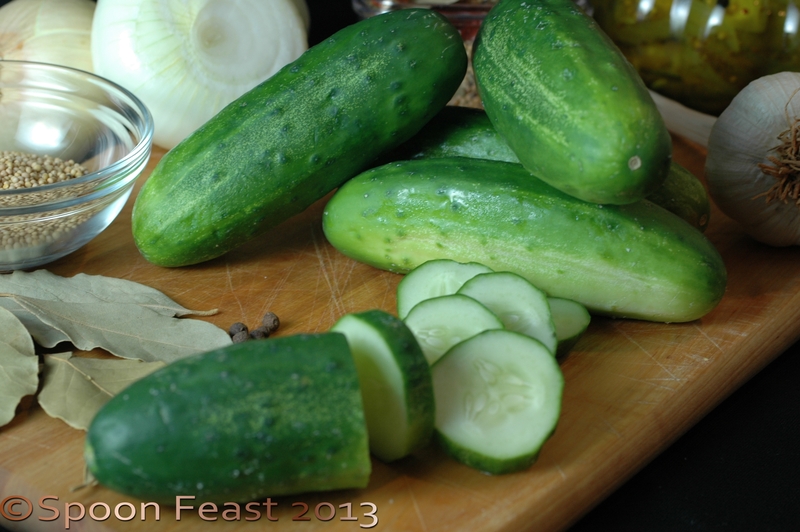 This entry was posted in Cooking Thoughts, In My Kitchen and tagged cooking, Cucumber, Deviled egg, Home, In my kitchen, Kitchen, Pickled cucumber, Pickling, Relish. Bookmark the permalink. 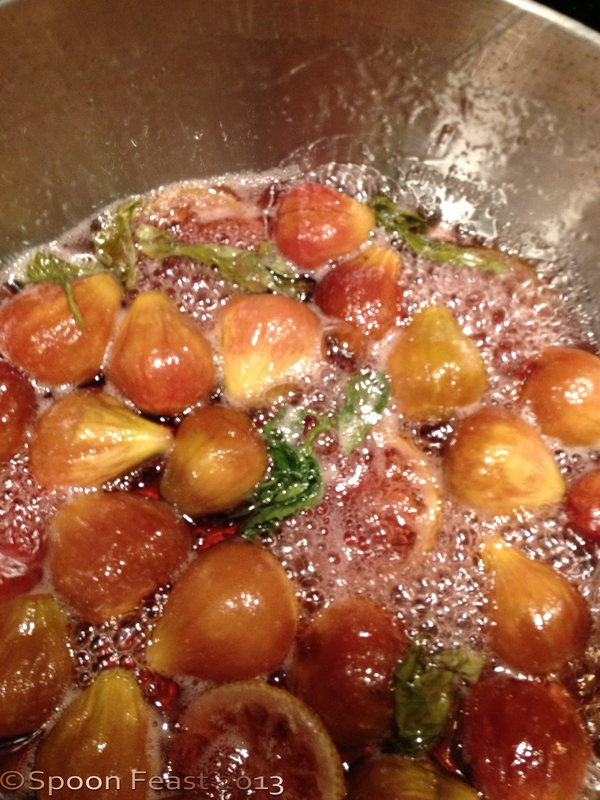 Yum, yum, fig preserves on a hot buttered biscuit. YUM! I slather it over goat cheese or warm brie . . .I’m going to gain some weight this winter. . .
Whatever ate your horseradish must have had a strong constitution, that stuff can be spicy! Can you see the egg holes as indents? It is quirky isn’t it, I see mostly domes with only one or two as indented. Nope, I see them all as domes! Even though I KNOW they’re indents! That is so cool! Thanks for sharing. I hope you have a great day, Celia! Wow, you really have been busy. I’m hoping to reap the benefits of ‘captured summer’ this winter. I’ve been throwing herbs into all me jams this year; where they add such a new dimension the the flavors. Last night I made some blackberry jam and added sage. Yummy! Pamela you have made an amazing amount of stuff, and it all looks good. I can only see domes. I tried to see indents but I can’t. Isn’t it like those odd pictures that you stare at and see 3-D objects? I couldn’t ever see those either! Now I’m wondering if I put an egg in one or two would the others still look like domes? Post the photo, it would be fun! There is nothing like fresh horseradish. One of the things I like best about grating my own is knowing what’s in it. 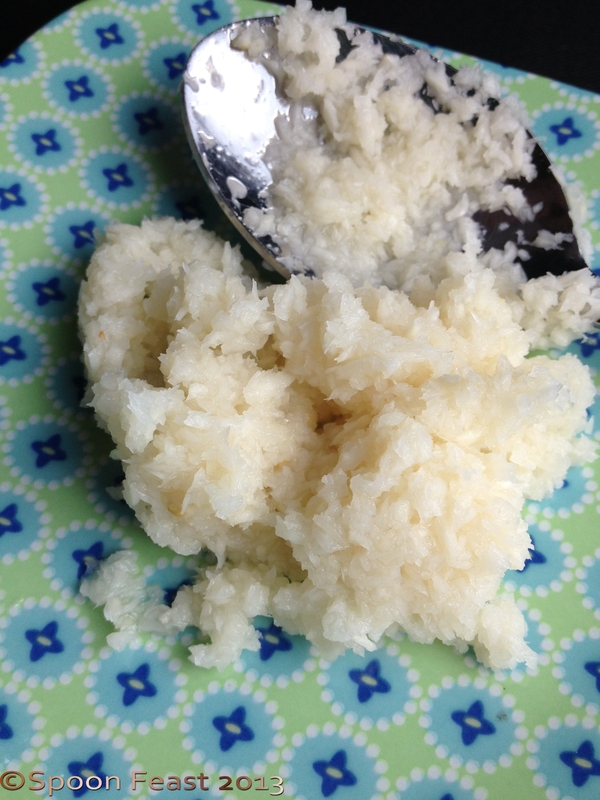 Ever read a label on commercially processed horseradish? All you really need is horseradish, vinegar and a pinch of salt. Here’s to hoping for a mild winter. Our summer has been like late spring rather than summer. It’s a relief actually. When Pamela first mentioned adding sage to blackberries, I turned up my nose. Sage was for smudging in my experience, not for eating! But, as usual, she is correct and the taste is fantastic. It does bring out a depth of flavor otherwise missing! Thanks for being a good sport and trying it Robert! It’s been fun playing with lots of flavors this summer. Definitely domes unless I really concentrate! Weird. I love the flavour combinations you’ve used. Now, I was planning not to make jam this year as I have so much stored, but now I’m very tempted. You’ve been so busy. It all looks wonderful. 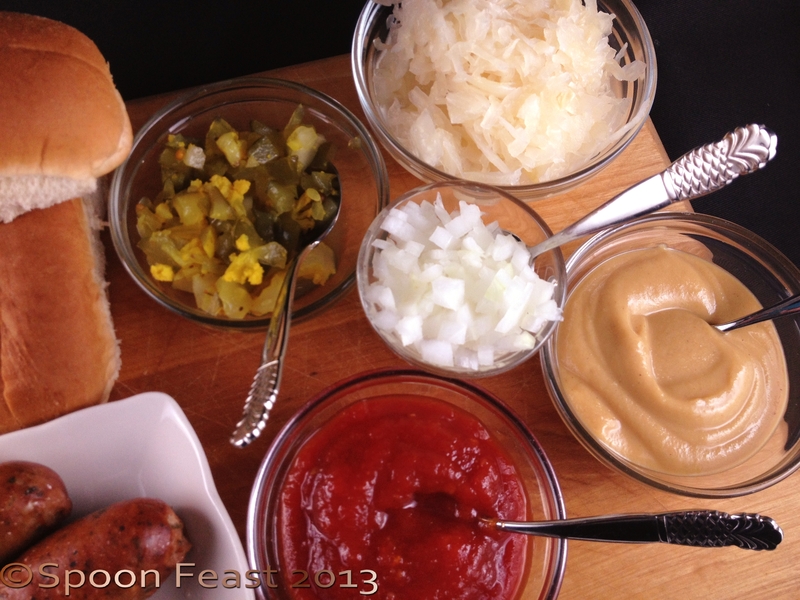 I’m working on recipes and photos to post soon for each of the jams. The flavors really are quite nice! Your post was up on my computer and my little one saw the picture of the horseradish root and said “mama what is this sea creature? 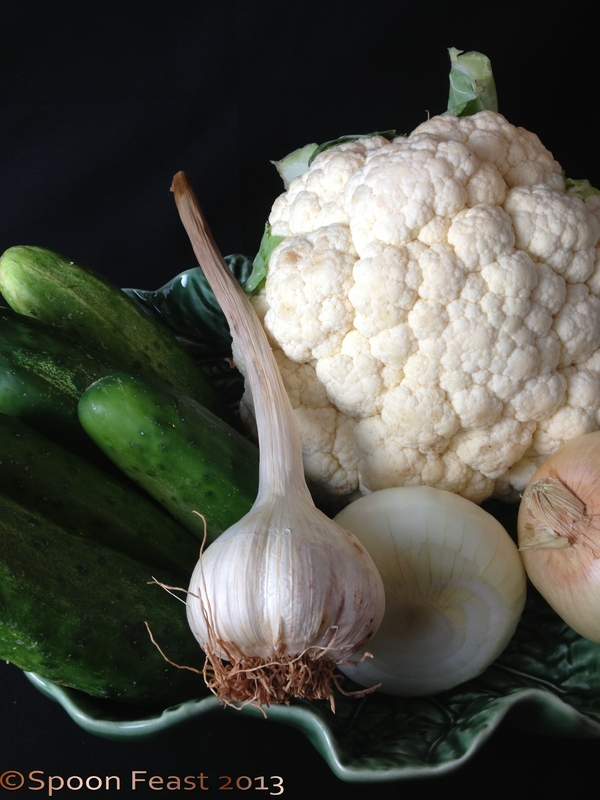 !” He couldn’t believe that it grows in the garden! They say the cutest things, I esp enjoyed the bikini comment one of them made this week! Wow, so many good things happening in your kitchen! I love your jams and preserves! Thank you! They have been so tasty, I hope they can last until winter! G’day Pamela and I too was amused by your optical illusion dish, true! They taste wonderful too! I have recipes coming soon, this weekend. Stay tuned! You have been so busy with canning. It sounds like you will be enjoying the fruits of your labor all winter long. I’m hoping we’ll still have some! I should probably hide a few jars somewhere so we can enjoy it during a snow storm. That reminds I must try strawberries and balsamic vinegar one day soon. You have been busy cooking in the kitchen. It was a pleasure reading your IMK post, Pamela! What a beautiful, bountiful garden you have. 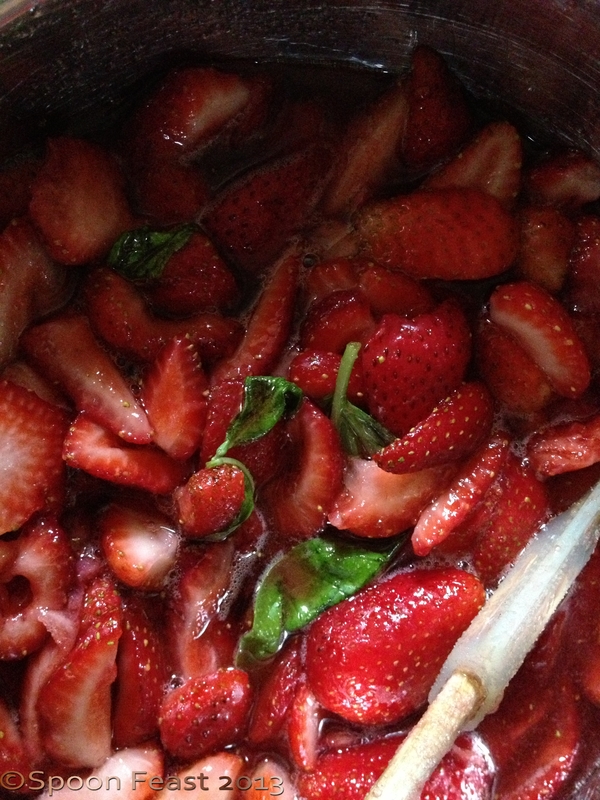 Your strawberry balsamic basil jam sounds delish — all of them do! My eyes are still boggled by the optical illusion, ha — looked like big water droplets on a plate. i never expected the egg plate to photograph like that, a total surprise!